Cambridge is 3 miles (5 km) west of downtown Boston; 6 miles (8 km) southeast of Lexington; 15 miles (24 km) southeast of Concord. 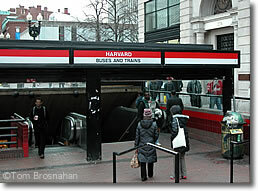 The MBTA's Red Line subway connects Harvard Square to Park Street Station on Boston Common. Service is the fastest, most frequent, and most comfortable in the system, and the journey normally takes about 15 minutes from fare gate to fare gate. Going from Harvard Square into Boston, take any "Inbound" train; all trains stop at Park Street Station, the subway system's central point. From Boston to Harvard Square, take trains marked "Alewife." Those staying in Boston's Back Bay section might find it easier to walk to Massachusetts Avenue and catch MBTA Bus 1 ("Harvard-Dudley"), which goes past MIT, through Central Square directly to Harvard Square, the last stop. From areas nearer to Boston Common, the MBTA Red Line subway is faster than the bus. From Boston, take Storrow Drive westbound along the south bank of the Charles River, or Memorial Drive westbound along the north bank, and follow the signs to Harvard Square. You can also follow Massachusetts Avenue ("Mass Ave") from Boston across the Charles River and all the way to Harvard Square. Bike paths extend along both sides of the Charles River from the center of Boston all the way to Harvard Square and beyond. (buses & subway trains) in Harvard Square, Cambridge MA.